The WAC1214.FC6218 TAG Heuer Formula 1 Glamour Diamonds watch reinterprets the sporty design of the original Formula 1 timepiece with a feminine flair. The Bezel of this ultra-feminine timepiece is fixed set with 120 diamonds equal to 0.75 carats on a 37 millimeter polished steel case. 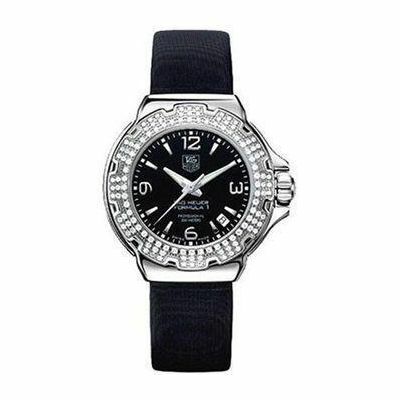 The dial is well designed with luminescent markers for the hour and minute hands as well as sleek hour markers and standard numerals at 3, 6, 9, and 12 which are hand-applied and composed of lacquer or mother-of-pearl depending upon which model of TAG Heuer Formula 1 Glamour Diamonds watch you choose. The strap is available in a variety of colors and materials which include black, pink, white, or brown Nizza (a woven fabric made from synthetic fibers); rubber; and satin finished or polished steel. The color of the watch face is coordinated accordingly with the strap and model specifications and is available in pink, white, black, or brown to match your style and preference. 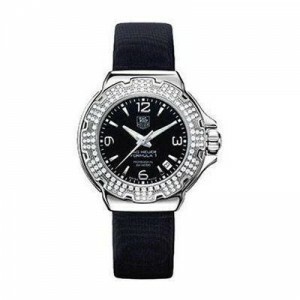 The clasp may be a pin buckle or a folding clasp depending upon the material of the strap and watch model. Quartz movement and a scratch resistant sapphire crystal complement the beauty and functionality of this watch which is also water resistant to 200 meters. Overall, the TAG Heuer Formula 1 Glamour Diamonds watch is a versatile timepiece which combines a sporty, feminine look with classic details. Gostaria de saber o preço da pulseira em aço polido do relógio Tag Heuer Formula 1 – Glamour Diamonds, pois tenho um e gostaria de trocar a pulseira.